The conflict over gas in the eastern Mediterranean is intensifying. 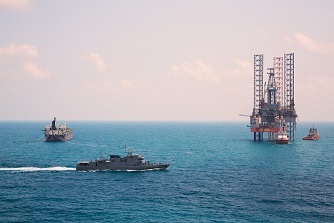 In February, the first case of intervention by the Turkish navy took place in the Exclusive Economic Zone (EEZ) of Cyprus. Last month, two more flashpoints have appeared. The dispute concerns gas blocks, i.e. areas into which waters around Cyprus have been divided. Turkey does not recognize the government in Nicosia or its agreements regarding EEZ. Ankara thinks that the right to extract gas should also be exercised by the Turkish Cypriots and also by Turkey in the case of Blocks 4, 5, 6, and 7, through which – according to Ankara – passes the Turkish maritime border (the map below). At the beginning of October, Cyprus put gas extraction in the disputed Block 7 out to tender,1)Cabinet looking for gas licensees for Block 7, Cyprus Mail, 2018-10-03. which the Gefira Team has informed about.2)Déjà vu: the gas conflict around Cyprus is getting worse, Gefira 2018-10-08. In response to this, in the middle of the same month, Turkey sent an exploration ship assisted by four naval vessels and began exploration in the area of 44 thousand km2, including blocks 4 and 5.3)Barbaros to continue explorations in Mediterranean, Turkish energy minister says, Cyprus Mail 2018-10-19. Nicosia and Athens consider it a violation of the Exclusive Economic Zone of Cyprus.4)Turkish navy stops Greek frigate ‘harassment’, Navtex borders Cyprus’ offshore blocks 4 and 5, Cyprus Mail, 2018-10-18. On October 18, another event took place. Greece reported that the Turkish ship had entered the Greek continental shelf, which provoke Athens to send the frigate Nikiforos to drive the Turks out.5)Turkey challenges Greek continental shelf, claims “frigate harassed Barbaro, Keep Talking Greek 2018-10-18. [Location of the Turkish research ship Barbaros Hayreddin Pasa in October 2018 in the disputed area in the Eastern Mediterranean. Source: Marine Traffic]In the vicinity of the disputed waters, exploration is carried out by, among others, Italian Eni, French Total and American ExxonMobil. When the Turkish Navy stopped an Eni research vessel in the EEZ of Cyprus in February, Rome decided to send a frigate.6)Italy sends frigate to Cyprus’s EEZ, Ekathimerini 2018-02-13. A violation of the interests of any of these companies will translate into the military involvement of other states, which may entail a conflict on a global scale. 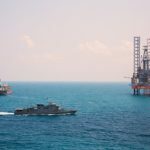 Turkish exploration in the disputed area is planned to last until 1 February.7)Barbaros to continue explorations in Mediterranean, Turkish energy minister says, Cyprus Mail 2018-10-19. Ankara, promising to take steps to secure its interests in the Eastern Mediterranean, accused Greece of carrying out an arbitrary demarcation of sea borders, which triggered the whole chain of events.8)Erdoğan says Turkey will take ‘necessary measures’ in east Med, if needed, Ekathimerini 2018-10-20. 9)Turkey ups ante in Eastern Med over oil and gas, Ekathimerini 2018-10-25. We expect that the conflict over gas around Cyprus will intensify because Turkey needs its own energy resources to reduce the trade deficit caused by the increase in the costs of the gas and oil imports. 1. ↑ Cabinet looking for gas licensees for Block 7, Cyprus Mail, 2018-10-03. 2. ↑ Déjà vu: the gas conflict around Cyprus is getting worse, Gefira 2018-10-08. 3, 7. ↑ Barbaros to continue explorations in Mediterranean, Turkish energy minister says, Cyprus Mail 2018-10-19. 4. ↑ Turkish navy stops Greek frigate ‘harassment’, Navtex borders Cyprus’ offshore blocks 4 and 5, Cyprus Mail, 2018-10-18. 5. ↑ Turkey challenges Greek continental shelf, claims “frigate harassed Barbaro, Keep Talking Greek 2018-10-18. 6. ↑ Italy sends frigate to Cyprus’s EEZ, Ekathimerini 2018-02-13. 8. ↑ Erdoğan says Turkey will take ‘necessary measures’ in east Med, if needed, Ekathimerini 2018-10-20. 9. ↑ Turkey ups ante in Eastern Med over oil and gas, Ekathimerini 2018-10-25. Next: Who is trying to outdo Hitler and Stalin in Poland in suppressing Independence Day? The map above is not accurate. It appears that you have included the Greek island of Kastellorizo in the Turkish economic zone. We’ve been watching these flashpoint grow for a while now. And, Turkey’s greed is too much for it to handle. So, it will go to war over these flashpoints. Remembe that these are the same people that murdered more than two million Christians a century ago. So, don’t expect any ‘ethics’ to keep them from taking what they want by force. You meant to say these same Europeans who killed 50 million people in WW2 and another 100 million espousing Communism. 2 Million? Pfft. Nothing compared to what the Germans and Russians have done. British, French and the Armenians killed over 10 million Turks prior. So there could be still 8 million difference in the books. War? Turkey has no chance. Cyprus is backed by US and EU. If Turkey goes to war, there is a big chance that Turkey will be dismantled.